Apps for your smartphone and tablet that integrate with Osprey-VLE. 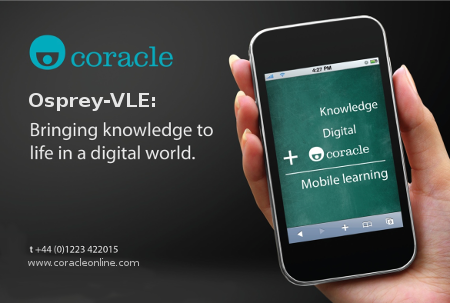 Coracle has long believed in the value of using mobile devices to deliver learning. Mobile learning content is more than just desktop eLearning in miniature! Learning via mobile devices are proven tools to nurture and engage with your team, your supply chain, your community and your prospects. Providing access on any device, and with Coracle's ability to allow offline access to the platform, anytime access has never been more suitable. No matter where you are and whether or not you have internet connection, you will be able to access learning materials at any time. We believe that this provides a massive leap into achieving our mission of "creating a world where no-one is isolated from learning opportunities" and to truly enable communities to learn together. Coracle have a dedicated team of experts that not only integrate your learning content onto apps, but design apps that will engage and motivate your learners. They do not just benefit the learner, they will also allow you as the administrator to monitor and manage your user base from your phone or tablet.